BILAL, Jazmine Sullivan, Kindred The Family Soul, Jaguar Wright, Dice Raw, Chubb Rock, Eric Roberson, Jean Baylor, Antoinette Costa, Jim Stephens, Selina Carerra, Kuf Knotz, Tony Moore and Jehova's Chosen, Mic Wrecka, Hezekiah, U CITY, WyldLyfe, Meek Millz and DJ Rocdaspot. 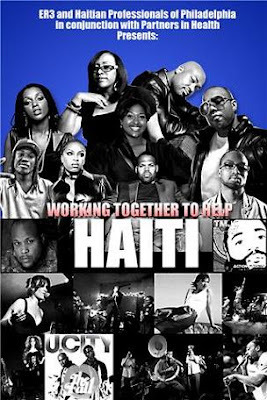 Proceeds go to Elite Rescue, Recovery, and Rebuilding, and Haiti Professionals of Philadelphia. There will be live artists, Brookyn-based Lichiban & Philly's own Iye Yinda donating and auctioning their work. There will be bins for donations of canned and dry foods, and medical supplies that will be sent to Haiti through the Haitian Professionals of Philadelphia.